It's Critical Not to be Critical - Something New Everyday! No one wants to spend a day with a critical person. If you have tried it you know just how it feels. When someone continues to find fault in you, or the objects around you, or the way you run your life, then you feel as though you want to run from them as fast you can. Commenting on a person’s possessions or circumstances is almost the same as insulting the person themselves. Criticism is an expression of disapproval and always follows a judgment. It almost implies that our life needs a ‘performance review’ and in this case we have failed… at least in the eyes of the beholder! 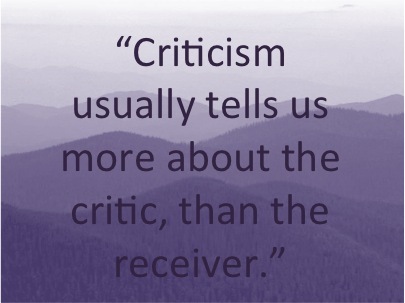 The fact is that criticism usually tells us more about the critic, than the receiver. Critics have a time and place to carry out their ‘vocation’, but unsolicited advice, especially when delivered with an air of superiority, never goes down well. Knowing what to say, when, and where, and with whom, is an art. But if we have a tendency to be critical (and who isn’t, from time to time?) then the lesson we really need to learn is how to be happy with ourselves. It is not our true nature to focus on the sad or bad. Focusing on the faults of the child will never make him or her grow up to be a ‘somebody’. Rather, he will always be seeking the approval of adults or peers even when he is in his rocking chair because that is how he has learned to measure ‘success’. The soul blooms when there is love, acceptance and acknowledgement. It’s much nicer to be complimented than complained about. Take birthdays as an example; the day when your inbox is filled with good wishes and blessings from all over the world. How do you feel? Even if you can see that something or someone needs improvement and can benefit from that, just try in that moment to accept the situation or the person… comment later if need be… but in that moment control your emotions, just try to expand your tolerance level, and increase your acceptance level. This very deed may help the other to seek guidance for improvement, or invite comments. But moreover, you will feel better for keeping a positive vision. You will find your relationships will improve in leaps and bounds. Anther major aspect to this whole exercise is to master the ability to remain quiet with the mind and the lips for a while, especially when I want to jump in or to react. If my mind is like any unleashed dog that barks and bites at anything passing by then it means I do not have a grip on my mind or my tongue. Treating ourselves more kindly and shifting our vision towards appreciation and gratitude for the people and things around us are the best antidotes for criticism. When I feel a sense of contentment within, then I don’t notice the little things around me that would otherwise bug me. And if I feel content with myself, then I am less likely to feel hurt by the criticism of others. Instead I can send them positive thoughts and good wishes, for they are the ones who are in need! It’s time… to shift your mindset and take a positive view. Being critical is destructive and unproductive, so for your own good and the good of others… it’s critical not to be critical!